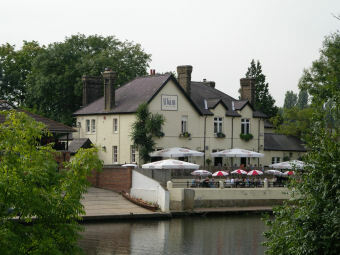 A pub that has 1 large lounge with the bar in the middle, Whilst the lounge is comfortable with fine views over the Thames, it is principally laid out for the sale of food. Although the bar had 2 hand pumps, there was only Doom Bar available on my visit. 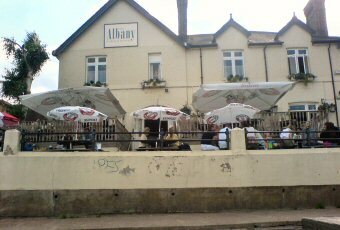 It has a large patio area overlooking the Thames but since it was a cold misty winter's day on my visit, there was nobody sitting outside. Riverside eaterie trading on its location and 3 years after the last reviews the outdoor tables and parasols are still covered in insects and cobwebs, surely an occasional brushing is not too much to expect. Three ales on yesterday, Everards Brazilian-style Xingu which was refreshing but a bit too lagerish for my taste, Youngs bitter which was better than expected and Adnams Broadside which was not tried. The food for our party of six was of middling quality posily presented and a bit short on quantity hence I felt it to be over-priced but as I live 50 miles away I do not know what other local establishments might charge. However I have eaten better and cheaper in Central London. I am unlikely to return. Luckily this did nothing to spoil our enjoyment. Overall we had a lovely time, a very enjoyable meal and will certainly return here and would be happy to recommend it to others. P.S. When I say the furnishings are nice, i.e. style. But The Albany needs to be cleaner. The umbrellas outside are full of insects and spiders which is very off putting when you want to enjoy an outside drink and I am glad we decided to eat inside.